It's just a matter of time before the United States goes metric. Did you know many industries in the U.S. have already gone metric? This book fills a gap of complete metric education for children and adults by providing an easy way to learn ALL the basic metric prefixes and supplying a metric conversion table within the book. Dradnats and the beautiful color illustrations inside are detailed and very uniquely drawn by the extremely talented and experienced illustrator, Lisa Rivard. Although Dradnats and the Metric Measurement Kids is a children's book, it will help ALL ages to understand the order of ALL the prefixes (which are lacking in standard elementary math textbooks and workbooks) and how these prefixes relate in size. The reader will learn that instead of having to use fractions in conversions and finding a least common multiple (common denominator), metrics offers an easy solution by multiplying by ten, dividing by ten, or simply moving a decimal point to the right or to the left. This book will enable the classroom teacher to easily teach metrics and conversions to students; it will also help parents and adults to understand the metric system. This will help children in metrics homework without the need of using the computer to do the conversions for them. The author feels this is very empowering and makes the whole system understandable. The child often cannot go to a computer to get an instant answer in conversions if faced with metric problems on a test! The author also includes a website where kids and parents can practice problems. Answers will be given to make sure the problems are done correctly. There will be easy conversion problems and more complicated conversions for the accelerated learner. Since very few people in the United States even understand what metrics IS and fact that over 90% of the world uses it, the basic concept of the book is an introduction to this wonderful measurement system! There is the Meter which is distance/length, the Liter which is capacity/volume (and easily shown as a liquid), and Gram mass/weight. Companies across the world want U.S. products in metric. We want our children to excel in math and science, and careers in these subjects demand knowledge of metrication. Engineering careers are leaning strongly towards metrics. Many children's books solely about metrics are sadly outdated with their presentation style. 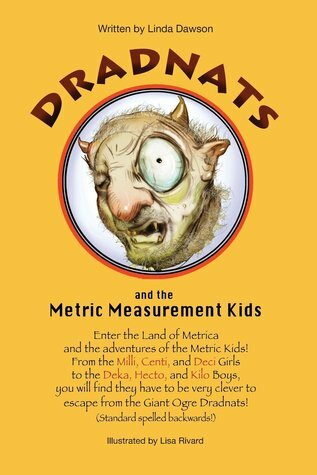 Dradnats and the Metric Measurement Style is the answer to the question, "How can I learn about metrics in a fun way with a I will enjoy?" It's way past time for the U.S. citizens to start making the transition to this measurement system, and this is a very good first step!